Just home from a Lord of the Rings dinner! 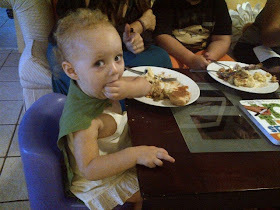 My son and his wife had us over for a 60th year anniversary dinner to celebrate LOTR's. It was a lot of fun and you can read all about it HERE,HERE,HERE! Here is one photo of my littlest granddaughter, Audrey, in her hobbit cloak! Lord, we are stuffed to the gills! Such a fun evening! Goodness! A couple of cousins, a couple of cards!!! I got another late night urge to create 2 cards for my 2 cousins. Here are the supplies I used. 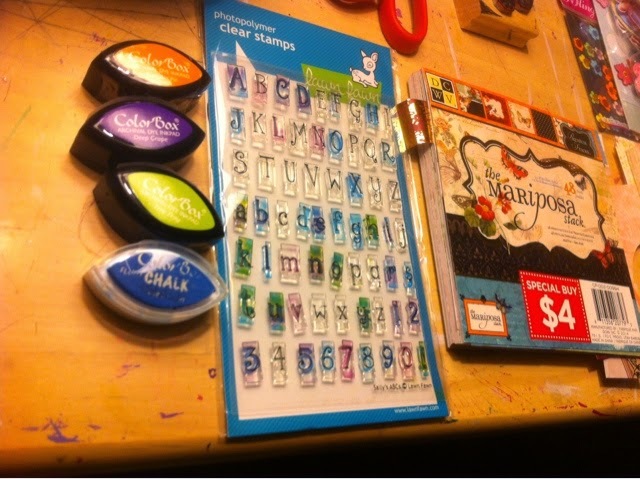 My new little football shaped ink pads by Color Box, my new letter and number stamps by Lawn Fawn, and the Mariposa card stock. Here is a closer look at the front of the letter stamp package. These babies ran me way more than I wanted to pay, but actually to have upper and lower case letters, numbers, and an exclamation point all in one cute font in just the right size, was too much to pass up. And here are the cards I ended up with. The big floral things at the top I found at the dollar store and they take all the guess work out of it. I pick out the focal point first, and then go from there. The nighttime lighting makes these look orange, but they are actually pink! I edged the lower card stock with my new Color Box chalk in a nice shade of blue. Can you see that? It gives it a border that makes it stand out and look more finished. I am posting these on my phone and am hoping you can see more details on your computers and IPADS. 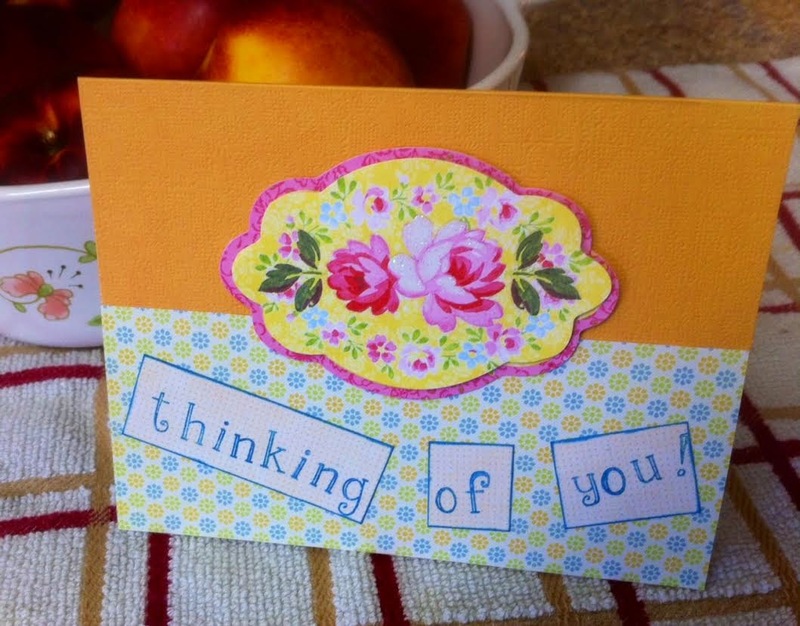 Thanks to my friend, Bobbie Lynn, over at Why I Love To Garden, for getting me going with card making!!! I made a handmade card for my to-be DIL, in Sioux Falls tonight. It turned out kinda cutely. I am also placing it on my sidebar, because I want you all to know that I am thinking of you too! Funny how your blogger peeps kinda get in your head as you see and do things throughout the day. In the midst of world and personal tragedies, my blog is my safe haven. A happy place, with friends I have made over the years. Anyway....just know I am always thinking of all of you, and wishing the best for you too! I am a beginner in stamping. That is obvious. I wish a had a scrapbook store nearby where I could take classes. Card making is fun. I really like to make my own decorative items for them, but these flowers were at the dollar store so I simply HAD to have them! 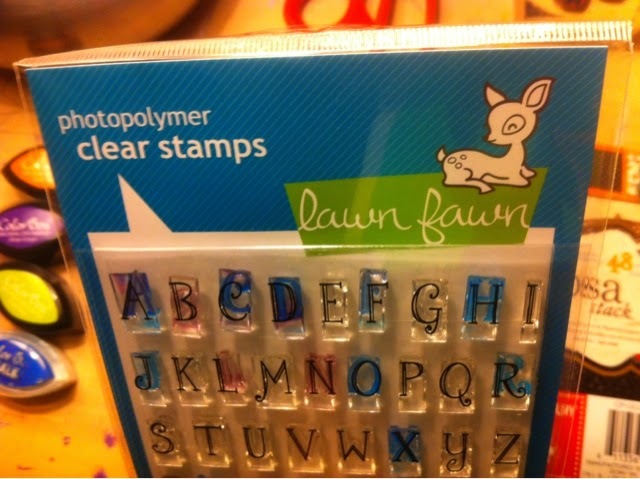 When I was in Sioux Falls, I bought the letter stamps. The set contained upper case, lower case, numbers, and an explanation point. YES!!!! 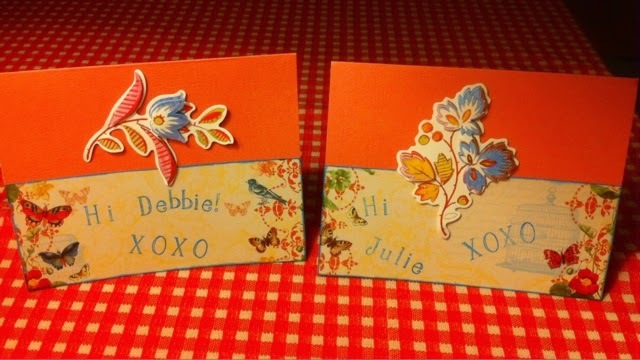 I made two other cards today, and dummy me, I forgot to take pictures to share. I will ask the recipients to snap a pic for me so I can show you later. Planning on getting better. This is just a start. No pictures, but here's what's going on around here. We have visited Sioux Falls, South Dakota, to meet our to-be daughter in law! We like her, and she is such a doll, so sweet. She is a pharmacist, but getting her certification in oncology at a hospital there. Smart chick!!! Sadly she had tragedy hit her family and she received the call just after we had come out of a wonderful ice cream shop, and we were all laughing and having a good time, when the call came. Afterward we did not get to see her again as we had to fly out to Louisiana in the morning. I have texted and emailed her, and sent her flowers. I hope she will stay in touch with me and tell me how her job is going. She knows NO ONE in Sioux Falls. My step-son had just help her move up there the week just prior to us arriving. My heart goes out to her. She left a few days later to be with her family in Washington State for a few days, but did get back to SF to start her job. In Louisiana we visited with all my husbands family. That part was all good, but we did have some wild and weird times at our Residence Inn. This is our most current hotel of choice since we can get a 2 bedroom suite with living room and full kitchen for the same price as 2 separate hotel rooms, when we have our daughter with us. Granted we could all stay in one room, but now that she is an adult, it gives her her own space, but yet we can be together. NICE. It sounded like the people above us were running a meth lab. They were up all night clomping, jumping, moving heavy objects. It made the glasses in our kitchen cabinets clink together. I actually walked up there after 2 days of it to see what I would find at the room above us, and sure enough, the door was closed, but the loud sounds were audible in the hall. I stood there and while and it sounded like glasses on a cart all clinking together inside, along with their clomping! Luckily housekeeping told us they were leaving that day! Thank God! We had a nice quiet stay after that. We visited a strange old museum filled with all taxidermy animals. The walls were painted with scenery, and each section was a diorama. Interesting, but also kinda creepy. Then there were the walls that talked about *Jesus and salvation. There is something about that that I just despise, and yes, I am a Christian!!!!! I'm quite sure any Jewish, or folks of other religions of the world would get out of there fast. I'm not really sure how they manage to stay open. The older wife of the couple who created it, was at the cash register, and they do not take cards (cash only). DUH...does anyone carry cash anymore??? I might have some on a lucky day when I haven't spent it already (like in 5 minutes at the grocery store)!!! Anyway, it was just weird, feeling somewhere back in time like that. We enjoyed the part of being there with the family though. *Please feel free NOT to comment on religion as this is just my own opinion, and I am not wanting to start a WW3 in the blog comments. Thanks!!!!! KISS, KISS! We still like each other, right??? OK. I sure hope so! I like all of you, no matter your religion! ;) No need to defend anything here. Of course we hit up many fabulous restaurants there. It was a great vacation. I am grateful. Oh, and a really amazing and funny thing happened on Fri night after we ate at a restaurant where my brother is the water taxi captain. We had appetizers, and then left and went on the 8 pm sunset ride with him, past the homes of the rich and famous in northern Palm Beach County. Got back and had dinner. Then I suggested we take my cousin outside to show her the rum bar, as it is very cool, with tiki huts, fires, just a very beachy scene with sand. They have pig roasts on Sunday, kind of a place. I just wanted to show it to her, and leave. Well, lo and behold I hear my SIL ask my brother if it was his high school reunion. There was a sign up with his (and my) high school name on it, with the graduations year and REUNION on it. He said, "I'm not 58", and right then I see the sign. Graduation class of 1974. Oh crap, it was my 40th class reunion!!!!! Talk about amazing that I would just walk into my reunion. Anyway, my brother and SIL just loved it, and they managed to drag a few people we knew over to say hi. They invited me to join then them next night, at a different location, but I couldn't as I was still busy. Not only was my sweet cousin here visiting, but I also had a funeral I would have gone to as a second choice as well. A work friend of mine who I have known about 15 years, lost her son suddenly. More tragedy. So my two weeks of vacation were filled with a lot of fun, and LOVE...too much tragedy, and some strange and interesting happenings. As a side note, Sioux Falls was amazing, and so gorgeous! Clean. The people were so friendly. They had a HUGE scrapbook store called R Scrapbook Store, complete with a coffee bar and huge classroom! When I tell you they had product, they HAD PRODUCT! Just fantastic! The only bad thing is that they do not sell off of their website. If you are ever in Sioux Falls, check them out, for sure! Oh, and our Residence Inn there was super!!!!! It is so nice to go away, but always nice to get back home again too! 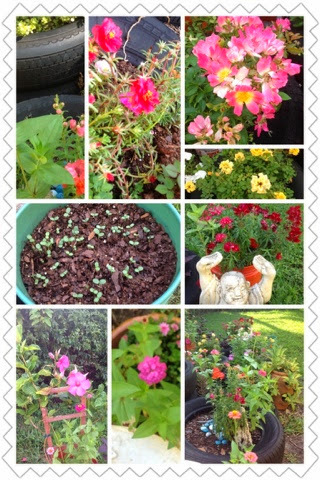 I'm doing laundry, cleaning, dead heading plants outside. The California Giant zinnias are about to bloom any day now...and I have quite a few parsley seedlings emerging for the Black Swallowtails. My brand new citronella plant I had bought right before we left was dying. I trimmed it up and brought it inside a while to rest. I think the heat and humidity was killing it. I had moved it out in shade, but to under hibiscus where it would get rain water while we were gone. Either too much water, or too much heat. It looks like it might be perking back up. Having it by the front porch has really worked to keep the mosquitoes away!!!! YES!!! I outsmarted you, little buggers!!! I'm not sure what you call this thing, but I made one a few years ago for the first child of some friends. Now this is the second child and I had to make one kinda the same, but a little different. You can see better close ups of the yarn and scrapbook papers I used HERE,during the making of the earlier one. The lighting was much better in that first post too. I am forced to take these photos under horrible lighting because I did not finish it until after midnight. In the morning, it gets wrapped up and taken to the baptism. Her middle name is Rose, so I had to use pink lettering! The first baby had green. The ribbon is grosgrain and has baby colors of buttons on it. It works for this, I think. 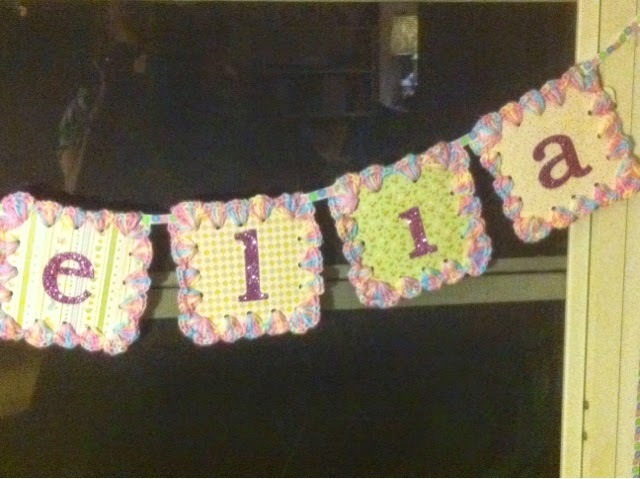 This is a super fast gift to make for a baby! 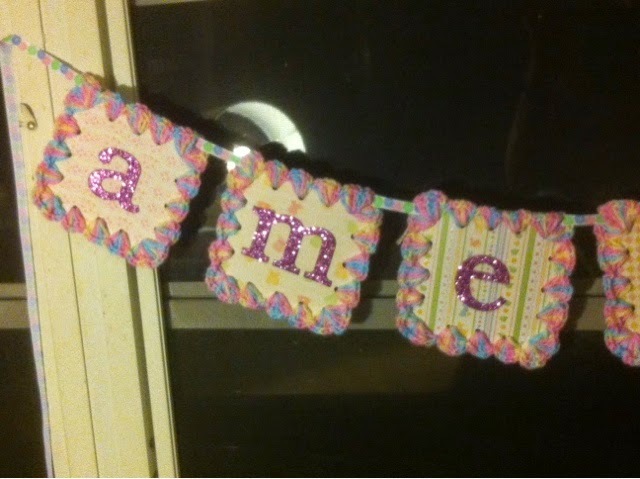 I used a baby set of scrapbook card stock (thick), punched holes around the edge and crocheted around the border, stuck on letters, and ran a ribbon through! 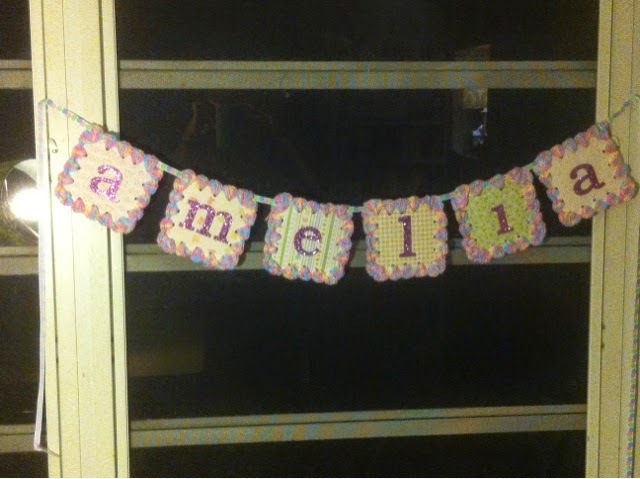 I understand the first child still has her name banner over her bed. I think she may have outgrown her crib! Well, I'm just happy they now have a matched set! So there you have my latest crafting adventure! 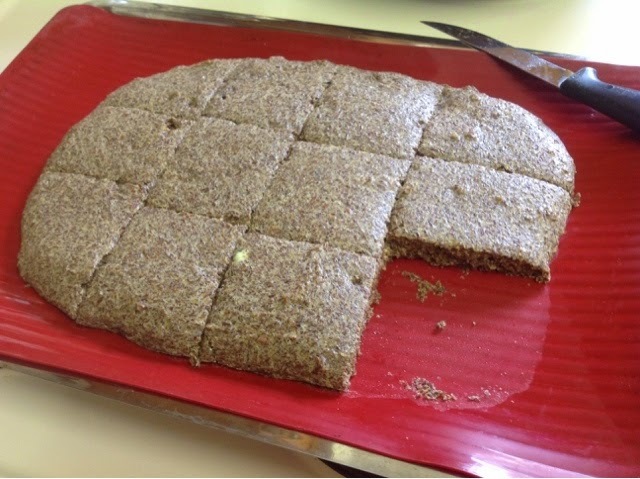 A flaxseed bread recipe and trial. FAIL ON FLAVOR, TEXTURE, AND ANYTHING ELSE! 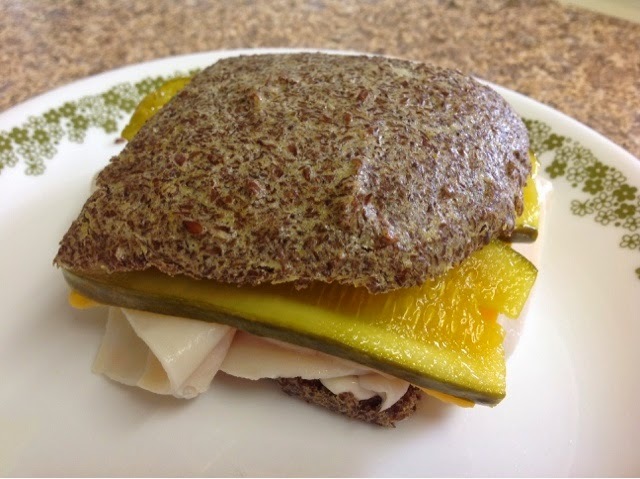 I was so enthralled at the idea for this bread when i came across it yesterday, i knew I HAD TO try it! There is even a lovely video to watch! I bought a bag of flaxmeal at healthfood store, and came home to make it in just the 20 minutes as the recipe said! I'm sorry to the person who made the recipe, and video. This is an honest opinion (only mine). Other folks might love this bread!!!!! It sort of looked like vomit when i took it out of the oven. It was very soft, so i waited for it to cool. The only way i could slice it horizontally was to leave it on the plate and slice sideways with the knife, verrryyyyy carefully. I ate the sandwich, but it had a slight fish oil taste from the omega 3 in it. It was a soft, gritty texture. Not much flavor at all, except the damn fish oil flavor! Gross. On a positive note, it is hi fiber, high protein, low carb bread. There were 5 eggs in it! It could be useful for a gluten free or lo carb diet. Might be ok if you used it for a fish sandwich since the fish taste would be expected there. It's just not for me! I hope the birds will eat it! On to look for other ways to use small quantities of the other half bag of flaxmeal !!!!! Hope something works out! LOL. First time trying a collage using PE-Fotoir, a free APP. Not sure how big it will show up on a regular computer or laptop screen. I will have to play around with it for sizing. This APP is very easy to use, and I suppose that is best for me! I hope to make more of these. We got absolutely minimal rain from the tropical storm that formed just off the coast from us. We were supposed to have rain tonight, but so far not much of nothin! Praying the North Carolinians do not have a hurricane for July 4th. What a mess! Having a quiet week as the grandkids are at their Dad's all week. We will be over there too for a BBQ and fireworks on Friday night. Hope everyone has a safe holiday, with lots of fun, and food!